Just About Anything: Mommy Moments: BLUE! These last few Fridays, my beautiful Marce Chris of The Mommy Journey has thought of featuring one color each Friday for Mommy Moments. So expect even more colors in the coming Fridays. This Friday, it is my favorite color, the color BLUE! Incidentally though, I don't have much in blue. Hehe! Perhaps I just love looking at anything with blue in it: the clear blue sky, the cool color of the sea, the blue color of violets... anything that is mostly blue is just so relaxing to the senses. My little one looks good in blue too but she only has very few blue items herself... She is a girl after all and I have the tendency to buy the pink and girly ones. I never really looked good in pink so I am dressing her up in colors that never really good on me. Mommy is not as blessed as her when it comes to skin color... I might as well ask Marce Pehpot to send over some Glutamax products! Lol! The photos below were the ones that I managed to dig from my photo archives. I just realized that she doesn't have any blue items in her closet except for her jeans! Must have a collection of clothes of different colors so that I can have something to post on Mommy Moments! LOL! Samantha was barely 3 months here. This was her first visit to the park. 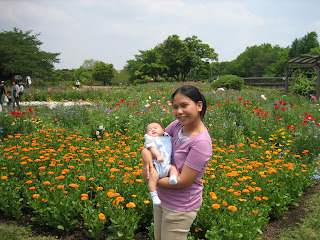 It was Spring then and we decided to visit the Showa Kinen Park in Tachikawa, Tokyo, Japan. polka dot baby blue blouse from Gap courtesy of my sister. Home Buddy! In her stay-at-home clothes and in her sleepwear. Almost one and showing off her teeth! 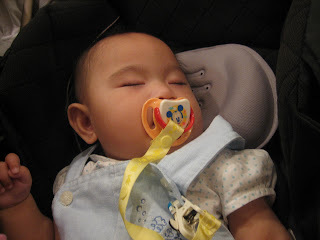 Hi sis, your kid is so cute.. I love her eyes and her smile.. Happy Birthday Ms. Kikamz! I wish you all the best. 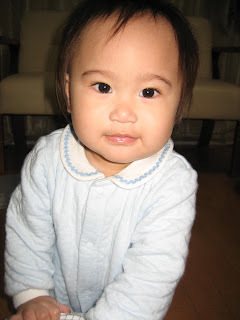 awwww such a cutie sis :) love her chinky eyes! 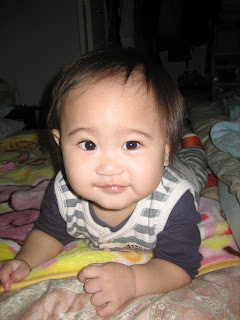 Ang cute cute naman ni Sam! Hala uy big na gyud si baby sam. 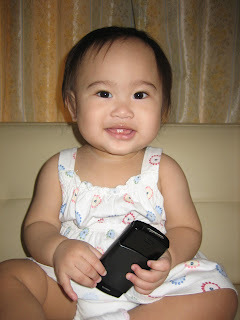 samut ka cute and gwapa imung baby kamz. what a cute little darling.. thanks for sharing! She's so adorable. She favors her dad, pero siyemnpre, kaya siya maganda, kasi kamukha mo rin, oh di ba? bumawi. She loks so cute in blue, ako kasi maitim, need ko dark blue..
Sam is so cute in these photos!